Whether you’re building a solid road performer or fire-breathing monster, the main goal is to improve air/fuel flow into the engine. The more you can get in, the more power you can get out. Cheapest chunk of power improvement comes from sorting the asthmatic manifolding and exhaust by applying a stage one kit. Then what? Considering the ‘get more in to get more out’ theme, the main restriction - all else being equal - is the valves and their behavior. How big they are, how efficient they are and how long they’re open for determines how much gets in with each gulp each bore/piston makes. 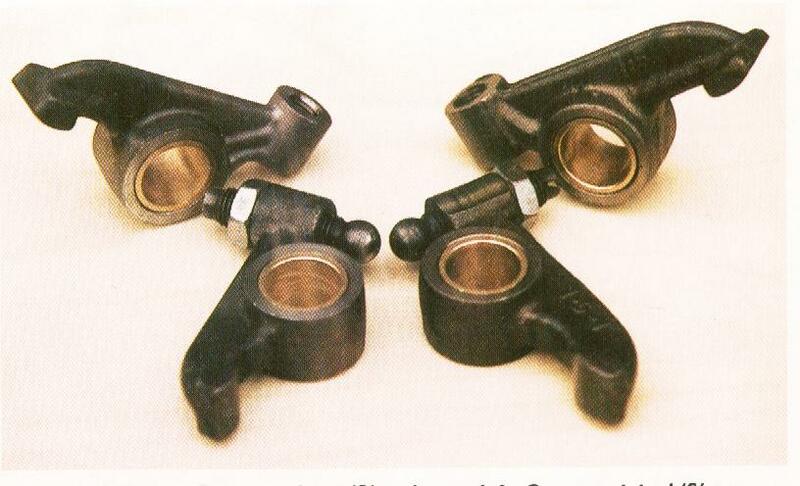 Modified cylinder heads are popularly next, although it has to be said that although a well modified cylinder head will improve performance, the gain against cost is nowhere near that given by the ‘stage one’ kit application. A good stage one kit’s improvement verses cost is around £12.50 per 1 hp, a decent modified head typically £30 per 1hp - dependent on application. Hmm. A change in camshaft will aid volume of consumption by holding the valves open longer, and/or pushing them further open. Performance gain here against cost is better than with most cylinder head or stage one kit changes - typically around £7.50 per 1hp. BUT a right pain to do properly. I stress ‘properly’ here, as doing a half-arsed job will eradicate the improvements promised by its fitment. Problem is the engine has got to come out. Not something many of you are busting to do. Particularly on the later model Minis with their ‘spaghetti junction’ pipe work and wiring. The only way of improving valve behavior then is the rocker gear. Recognised at an early stage by A-series engine developers as having potential, a number of companies have developed - others copied - them over time so several varieties now exist. Their power increase compared to cost is between around £18 and £35 per 1hp - depending on how you decided to skin this cat, but they are a cinch to fit! The eternal question ‘which ones are best?’ is constantly put to me. The answer sometimes makes folk smile in smugness, other times it’s ‘pass me a large brandy’! To assist in this dilemma, I’ve studied those generally currently readily available - considering everything from appearance to performance. First off - what are rockers all about then? Cam goes round, lobe pushes follower up, push-rod transfers this to the rocker which in turn opens the valve. Simple. Generally the aim is to open the valve as long, as fast and as far as possible - optimised for any particular application. A road car needs differing performance to a racer. This is pretty much governed by the ‘as long’ and ‘as fast’ bits and is established by the cam lobe profile. The rocker then mainly influences the ‘as far’ part. The cam lobe profile and height generally controls how far the valves are opened at any point, but the actual and final amount is down to the rocker gear. Appliance of science to the rocker gear can change this significantly by altering the leverage ratio - part of the ‘tech-speak’ banded about when rocker gear is under discussion (1.3 rockers, 1.5 rockers, etc.). The measurement is the leverage ratio. So 1.5 rockers have a 1.5 to 1 leverage ratio. When applied to cam lift, it’ll multiply whatever this is by 1.5. Theoretically - but I’ll leave it at that for now. There have been several types of rocker gear fitted as standard over the years. Pressed steel versions were the first used. The ‘S’ derivatives had a forged steel one. The early 1275GTs used the pressed steel item from the Austin 1300. Then in the seventies, the sintered steel rocker was standardised. The pressed steel ones were actually very good, and were only superseded by the sintered one because of production costs. Shame really. The ‘S’ one was thought to be the one to have - but in practice this isn’t so. The ratio quoted by many for these rockers was theoretically 1.25 to 1. Tame or what? Considering most manufacturers were using around 1.4 to 1.5 to 1. Worse, actual working ratios fell short of this. Examine the relevant pictures at the end of this article for their differences in appearance and actual working ratios. The rocker ratio is more influential than most believe. The main benefit of higher ratio rocker gear is usually conceived as giving more maximum valve lift. Although this is true, its biggest asset is having the valve open more at any given point of the cam lobe. This also means the valve is accelerated faster to be there, so has a perceptible influence on the ‘as fast’ criteria. For comparison, a 1.5 ratio set up will typically have the valve open around 20% more than the standard quoted 1.25. Consequently the engine draws in more air/fuel, and more power hopefully the result. On the face of it, the higher ratio you cram on, the better. Or is it? Having the valve open too far, too fast, can be detrimental to power - there may not be enough gas flow to keep up. So there are limits. There is also more to the rocker gear than just opening and closing the valves. The right materials need to be used in the right places. Controlled tolerances need to be observed. Functional geometry needs to be maintained. So let’s put each component under the microscope. The shaft. Increasing the ratio not only multiplies valve lift, it multiplies valve spring rate too. The increased breathing capability afforded means higher rpm can be used. Increased wear a slight problem, breakage a bigger one. 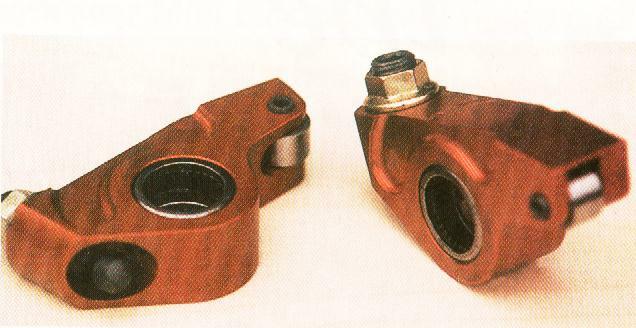 The standard shaft is adequate when standard cams are used. When modified cams are used, an up-rated thick wall shaft is strongly advised - a necessity on all race orientated engines. A worn shaft will contribute to excessive valve train noise, make setting accurate valve/lash clearances difficult and cause premature wear to the bushes. Fit a new one when engine re-builds are done, they’re cheap. Contrary to popular belief though, Tuftriding the shaft is a waste of time. It’ll wear the rocker bushes out faster than the shaft for no gain in strength. It’s far cheaper and easier to replace a shaft than the bushes. Posts. Early standard posts were aluminium. Four of the nuts that hold the head down tight are situated on each post. Being aluminium, they were either collapsing on torque down or spreading under load after a period of time. As a result head gaskets were giving up the ghost. Excessive squash also distorted the shaft so that it broke after relatively low mileage. Consequently they were substituted very quickly with steel items, an infinitely superior material for the application and have been so ever since. A fair illustration why using aluminium for the posts is bad move. The posts were standardised for the whole range of standard rockers. Any deviation away from the standard rocker ratio needs posts specific for the rocker type. That includes when using offset bushes. Don’t be told otherwise. Bushes. Fitted into all the standard A-series rockers, but not the latest sintered ones. Proper finish reamed bore size is 0.563-0.5635”. 0.0005” over this is too big. As with the shaft, excessive wear (or over-sized reamed finish) will contribute to valve train noise and setting accurate valve clearances will be impossible. If they’re worn, replace them and get them finish reamed to the correct size. If the bushes are reamed bigger than this, there will be too much clearance on the shaft and it’s back to square one. Service the shaft regularly as intimated before - far cheaper and easier than doing the bushes. Once fitted they need reaming out to correct size with specialist tools. Not your average DIY job. Offset bushes are available to increase lift, but you must use the right posts. Bearing in mind the grief fitting bushes is (and these are far harder) and the cost of the whole job - buy some decent higher ratio rockers. Spacers and spacer springs. 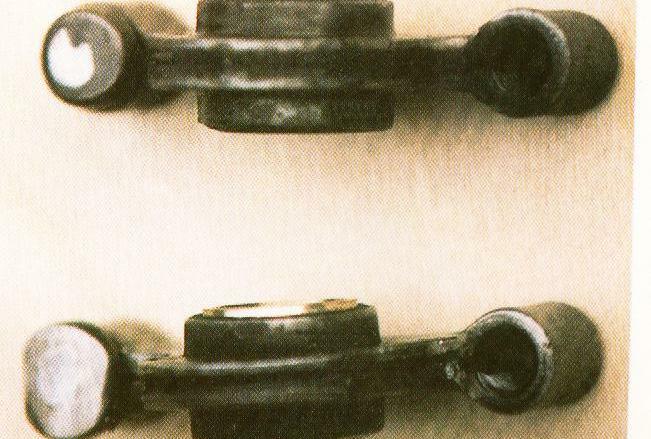 The standard rocker gear has used springs since the dawn of time. Aside from keeping the rockers apart, they do a good job of tensioning them too. This helps damp out noise caused by worn bushes/shafts and odd valve train harmonics. Makes lining the rockers/valve stems up supremely easy, and ‘self centres’ where head stud location inconsistency due to manufacturing tolerances is pretty-much standard. All sorts of hogwash is talked about what changing them for spacers can do. The biggest claim is the reduction of friction. This only occurs when the spacers are made the exact dimensions for the head that they’re being fitted to, and in my experience this is super rare. They are usually too tight causing them to bind, or way too loose allowing the rockers to float about. Both are definitely not good, and possibly disastrous. If you must use spacers - and they are fitted to a number of complete ‘ready to fit off the shelf’ rocker gear kits - once the rocker gear is fitted and head nuts torqued down, make sure the spacers revolve easily using thumb and forefinger. If not, take it all apart and do something about it. Can be a pain to sort, but essential for longevity. The friction produced by the spring is almost immeasurable, any possible power loss through drag certainly not measurable on an engine dyno. Rockers. We already know what the standard ones are about, but if looking to replace the standard set up, here are a few things to consider. 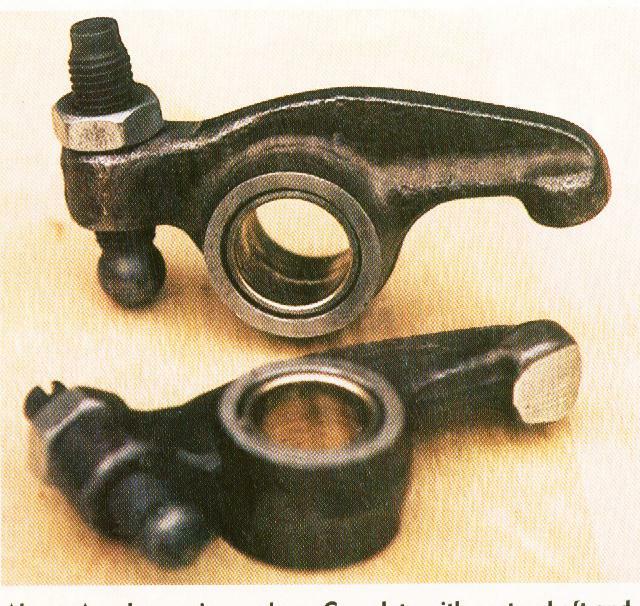 Forged steel rockers are very strong, and are cheaper than most other types on the replacement parts market. Alternatively Mini Spares has produced a specific casting method that gives good integral strength to cast rockers. Overall weight isn’t really important, as most designs are well shaped. A reasonable pad area means less hassle lining them up with the valve stem tip. A well- developed pad contour is essential to reduce side loading on valves and guides to a minimum. On lifts up to around 0.420” this is negligible. Aluminium rockers abound in varying designs. They’re plenty strong enough for the application, particularly as there is a great deal more material in cross section than conventional steel types. They all have roller tips, virtually eradicating side loading on valves/guides, but make sure they do. Roll that is. Pointless having them otherwise. Some roller tip pins are ‘C’ clipped in place. Others are splined/pressed in to maintain position (ally expands more/faster than steel). Some have needle rollers instead of bushes running on the shaft. Complete over-kill. Needle roller bearings aren’t really suited to reciprocating action. Rocker instability (sloppyness) another feature. A plain bearing is probably better as it gives far better support against the shaft. Correctly sized, stability is maximised and keeps costs down too. Anodised in various colours makes them pretty to look at. But remember - beauty can be skin deep! And most importantly, those chosen should give and maintain the desired ratio throughout the lift cycle. Don’t snigger. Achieving this would get Pythagoras going! Hours and hours of measuring go in to sorting rocker gear properly and equally as many - if not more went into carefully establishing the actual rocker ratios of the sets on test. 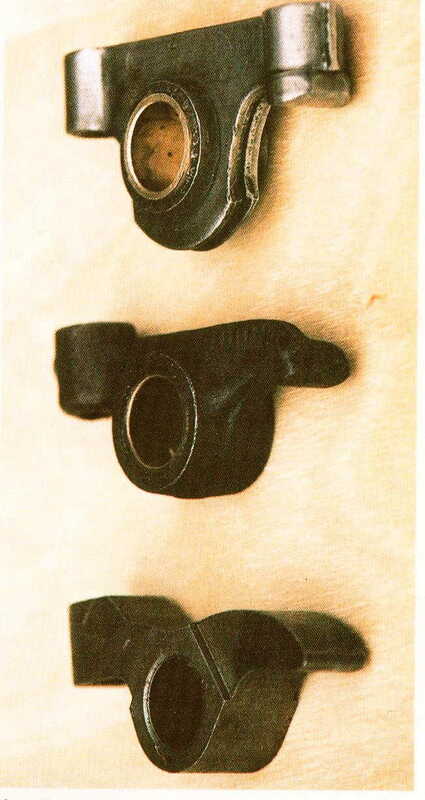 From the top -1275 pressed steel (1.27:1), forged original ‘S’ (1.22:1), and latest sintered type (1.21:1). Actual ratio drops as cam lift rises, so ratios are even lower when used with performance cams. So whatever you do, change them sintered rockers! Assessment of available after-market rocker gear. 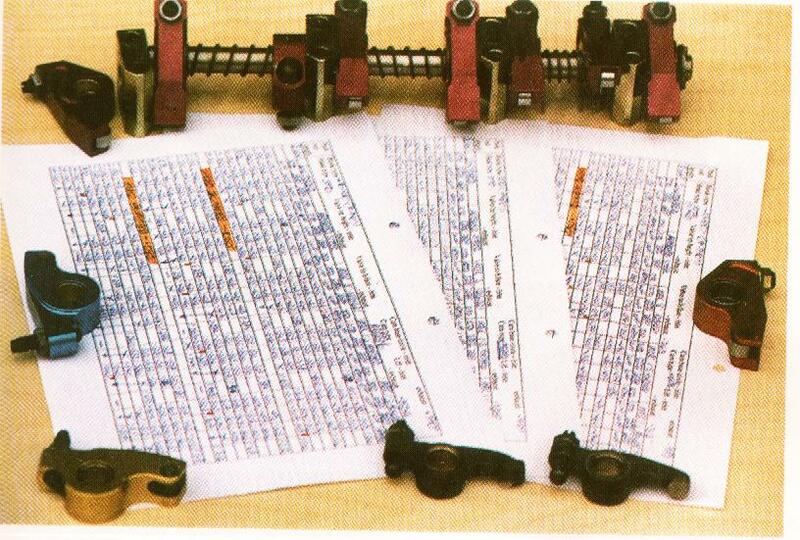 Actual working ratios (AR) measured using typical fast road engine set up. MD276 cam, head skimmed -0.050”, block skimmed to clean only, and average length standard push rod. No valve clearance used. As a rule ratios tend to go down as cam lift goes up, and vice versa. Mini Spares Centre Rockers. ‘S’ 1.25:1 rocker (left). Supplied in single rockers only. Specially cast to original S dimensions, except ratio has been sorted to give better lift. Bushes finished standard size. AR slightly erratic. AR 1.26:1. Hi-lift 1.5:1 forged rockers (right). Kit contains rockers, posts, shaft, adjuster screws/nuts. Thick wall shaft. Bushes finished standard size. Steel posts. Good quality forging. Ample pad width and well formed contour. AR consistent. AR 1.58:1. Mini Sport roller tip rockers. Sets come built complete with rockers, posts, shaft, adjuster nuts/screws, spacers. Aesthetically very attractive. Standard shaft. Bushes finished some 0.0013” oversize. Profiled alloy posts (anodised - 1.3 gold, 1.5 black, 1.7 silver/self colour). Profiled rockers from alloy billets (anodised - 1.3 light blue, 1.5 red, 1.7 gold) with roller tips. Pins and rollers heat-treated steel giving notchy action. Pin held in with circlip. Roller/valve alignment good. Anodised alloy spacers are short, allowing rockers to wander excessively. AR fairly consistent. AR 1.27:1 (1.3), 1.53:1 (1.5), 1.67:1 (1.7). 1.3 type - Roller/non roller. All small-bore irrespective of cam, including full race except where every last ounce of power is sought at the expense of mid-range. 1.5 type - Non roller. All large-bore. Negligible valve/guide wear when valve lifts barely exceed 0.400”. Use on full race small-bore only as extra lift/acceleration can out-strip available gas flow available causing power/torque loss. 1.5 type - Roller tip. All large-bore irrespective of cam type. Full race small-bore only as above. 1.5 type - Full roller. Instigator of the trend. Exotic and over the top, but recommended by many engine builders despite cost. Over the top for road use and noisier than bushed types because of extra 'slop' on shaft. 1.7 type - Roller tip/ full roller. Should be considered for carefully developed full race package only as the lift developed by this set up can be too much, hurting power rather than improving. Think on this - it’s rarely worth lifting a valve higher than the cylinder head's peak gas flow point! Identifying pressed steel rockers. Top shows round pad of the small-bore one - 1.23:1 actual ratio. Bottom shows oval pad of big bore version - 1.27:1 actual ratio. Avonbar Racing 1.5:1 Rockers. Kit contains rockers, posts, shaft, and a few shims. Standard shaft. Bushes finished standard size. Steel posts. Good quality forging. Reasonable pad width and contour. AR reasonably consistent. AR 1.47:1. Mini Spares Centre 1.5:1 roller tip rockers. Kit contains rockers, posts, shaft, adjuster screws/nuts. Thick wall shaft. Bushes finished standard size. Profiled steel posts (gold coloured). Extruded alloy rocker (anodised purple), profiled, with roller tip. Pin and roller finish ground for smooth action. Pin splined/pressed in. Roller/valve alignment good. AR extremely consistent. AR 1.51:1. Also available in 1.3:1 ratio. Titan Motorsport 1.5:1 full roller rockers. Sets come built with rockers, posts, shaft, adjuster screws/nuts, spacers. Special shaft has bigger diameter and super hard finish to withstand needle rollers. Needle rollers in rockers, feature seemingly excessive ‘‘play’ on shaft. Steel profiled posts coloured black. Extruded alloy rockers (typically anodised gold) with roller tip. Pin and roller finished ground for smooth action. Pin splined/pressed in. Roller/valve alignment good. Steel spacers fractionally too long, causing binding on rockers when fitted to engine so need careful attention when fitting. AR reasonably consistent. AR 1.53:1. Also available in 1.3 and 1.7 ratios.